Butterfly Effect Project founder Tijuana Fulford and JABS owner Jill Schroeder in their new Riverhead space. You’ve probably been hearing a lot lately about the work being done by The Butterfly Effect Project, Tijuana Fulford’s program to help empower girls, which has been growing by leaps and bounds in Riverhead and Flanders, and may be expanding to the North Fork. That’s no accident. Ms. Fulford, who had been pursuing her passion in her spare hours while working full-time, decided earlier this year to make her passion her full-time job. But with that full-time passion came a need for office space and The Butterfly Effect Project’s president, Karen McDonald, didn’t have to look far to find a perfect host. She put out a Facebook request for office space, and one of the first respondents was Jill Schroeder, owner of JABS fitness studio, who had just opened a new location in Riverhead. Ms. Schroeder didn’t hesitate to offer to donate office space to the fledgling non-profit. Tijuana Fulford in her new office, with a sign bearing the handprints of the original BEP girls. 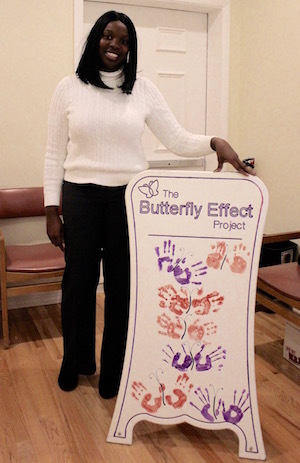 The Butterfly Effect Project held a grand opening of the new office space Nov. 1. Ms. Fulford said that many grants The Butterfly Effect Project is applying for require them to have a physical office space, but without grants, they couldn’t afford an office. JABS helped fix that Catch-22. Ms. Schroeder, who opened the Riverhead studio earlier this fall, said she was tagged on a Facebook post looking for space for The Butterfly Effect Project. They also have a shared anxiety — leaping out to expand work that has been their life’s passion, with no promise that they will be successful. Ms. Fulford said she wondered to herself whether she would be setting a good example for the Butterfly Effect girls if she did something as irresponsible as quitting her job, but her friends Tonya Miles and Angela Hunault, along with her husband, Troy, told her she had to follow her life’s mission. “It was the scariest thing I ever did,” she said. Ms. Schroeder shared that leap of faith in expanding her own business. Ms. Schroeder said that community support has been the key to her success in Cutchogue, where people who participate in exercise classes often hang out and meet up with their friends even when they’re not taking classes. Ms. Fulford said she’s received a lot of help since she moved into the office — Peconic Pediatrics donated computers and Norm Gopen donated IT services, while a group of volunteers are working to put together a big benefit Motown night at The Suffolk Theater Dec. 28. Lon Dolber of American Portfolios Financial Services, along with Ed Levine of Primo Productions, are helping put together the show, arranging for That Motown Band to perform and putting together posters and flyers for the event. “All they want me to do is show up,” said Ms. Fulford, chuckling — she has done more than her share of the detailed work of organizing fundraisers, and knows the value of this gift. Tickets to the fundraiser are $39 and are available online here. Ms. Fulford said the office space has helped to keep her grounded and thinking on the big picture — helping as many girls as possible, and making sure she’s on strong enough footing to expand into other communities. The Butterfly Effect has now expanded to the Riverhead Charter School, and she’s looking into forming a group on the North Fork. “I’m excited to see what will happen in the next three to six months. We’ll be able to expand into other communities,” she said. And that growth starts with a place to call home. “This help comes with nothing — she’s not expecting anything in return,” said Ms. Fulford of Ms. Schroeder. You can reach The Butterfly Effect Project’s office at 631.591.0759 or by emailing contact@bepgirls.org. JABS’ Riverhead fitness studio can be reached at 631.381.0924. Both are located at 1149 Old Country Road (Building D) in Riverhead.